A while ago, I got the crazy idea to make a centaur? Why? My love of all things fantasy. I rationalized that it couldn’t be THAT hard right? Turns out, it’s easier than you might think. You need a horse sized for 18 inch dolls with a rigid frame and an 18 inch doll. And a few tools and a bit of time. Warning: I take apart and modify a doll and a horse in this video. If that disturbs you, this is not the video for you. But if you’d like a centaur of your very own, I’ll show you how. In the video, I make my centaur from a Journey Girls® doll and a My Life As™ Horse. The first centaur I made I used an Our Generation doll. You should be able to use most brands of 18 inch dolls, as long as at least half of their body is cloth. All vinyl dolls won’t work. As for the horses, any brand will do as long as it has a rigid internal structure – not stuffed. 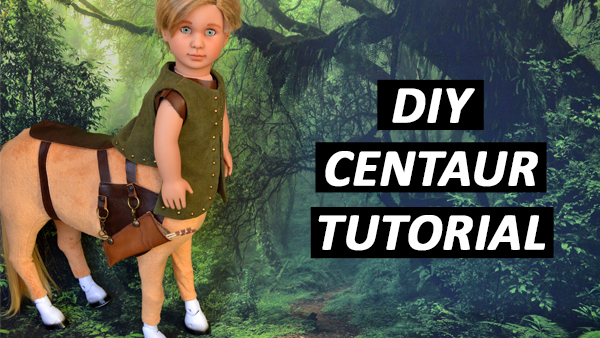 This is a fairly long video because while the process of making a centaur is not difficult, it does take time and I wanted to be sure to show you every step. You might want to skim through it first and then watch it in chunks as you make your own. Safety equipment is ESSENTIAL for several steps in this video. I would not recommend that children under the age of 13 attempt this and adult supervision is a MUST. Do not take chances when it comes to safety.